Mexico’s deep roots of poverty which have been systematically ignored by both the political and social spheres throughout its history. Over 23 million people live with an insufficient income to buy the minimum basket of food, even if they disposed all their income to do so; over 60 million cannot afford the minimum basket of goods and services. 72.2% of the indigenous population (vs. 42.6% of the non-indigenous population). 61.6% of the rural population (vs. 40.6% of the urban population). 53.8% of the under 18 years old (vs. 40.7% of the population between 18 and 65 years). Poverty is hard to contextualize because more than a concept it is a way of life that is suffered distinctly across populations: in the rural and urban areas, by different age groups, across sexes, regions, climates, cultures, and so on. Some additional numbers should serve to make the point. Illiteracy rates are over four times higher than for the rest of the population, with 27% of the indigenous suffering it. According to UNICEF, 33.2% of under 5 years old presented stunted growth. Mortality rate for indigenous children is over 60% higher than for the general population. According to CONAPO, in the mainly rural state of Chiapas (58% of the population live in towns with 5,000 or less inhabitants): 37% of the population did not finish primary (elementary) school, 70% earn an income below two minimum wages, 25% live in housing with dirt floor, 18% cannot read or write. In the state of Guerrero (49.7% of the population live in towns with 5,000 or less inhabitants): over 20% of the population lived without access to sewage, 29.8% didn’t have access to tubed water, 20% lived in dirt floor housing, 17% cannot read or write. The problem of children is as obscure as those of the other groups but in a different way. 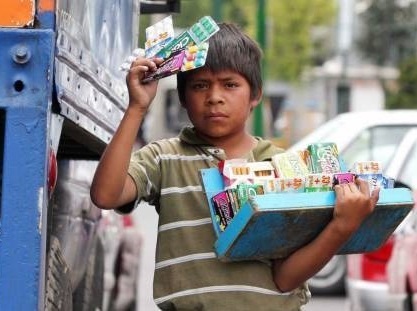 According to INEGI, around three million Mexicans between 5 and 17 years old work (12.5% of the total), of which more than two thirds are boys. Of these, 44% do not receive an income, 28% earn an income below the minimum wage and only 8% earn more than 2 minimum wages for their work. Furthermore, over 40% of these children work to complement family income or work; over 25% do so to pay for schooling materials and own expenses and only 5.1% did so to avoid schooling. In Mexico, life is much harder for some that for others. However, it is striking is to find that poverty in Mexico is, more often than not, the result of exclusion. Looking at the level of need that large groups of the population have points towards the cyclical transmission of the problem across generations. Paradoxically, the missing component for the country’s long waited economic flourishing lies precisely in whether the country is capable or not of unleashing individual potential across every group of society. Giving opportunities for development to the population would not only create a more just society but a much more dynamic one too.